Though some consternation followed the appointment of Matthew Smith to the role of Eleventh Doctor, the relatively unknown thespian quickly won fans around with his likeable persona and floppy Hugh Grant-esque hair. Further breathing new life into the franchise were some markedly more convincing special effects than had featured in previous outings, and the addition of world-renowned film and TV writers like Simon Nye (Men Behaving Badly) and Richard Curtis (Four Weddings and a Funeral, Love Actually, Blackadder), the latter penning ‘Vincent and the Doctor,’ what is perhaps the series most imaginative and fully-realised episode. The Eleventh Doctor and new companion Amy Pond (Karen Gillan) try to save the world in twenty minutes from the Atraxi, a group of galactic policemen who are after Prisoner Zero, a shapeshifting alien that has escaped from the prison of the Atraxi. The Doctor takes Amy to the distant future, where she is somewhat taken aback at finding Britain in space. The Doctor and Amy are in London during World War II, and meet the Daleks and Winston Churchill. In this two-parter, the Doctor and Amy meet sassy space vixen River Song, a spaceship crashes and the Doctor hunts a Weeping Angel in the ruins of Alfava Metraxis. As the angel can only move when unobserved, this necessitates much no-Doz and coffee consumption. Given the current fad for all things fang-related, it would have been remiss of the New Doctor not to cash in. The title pretty much says it all. In Venice, which is protected by the House of Calvierri, bodies are being found with their blood drained out of them. There's something in the Canal (hint: it’s a vampire), and incidentally the beautiful Calvierri girls cannot be seen in mirrors. No, Amy is not forced to choose one of her children to die at the hands of Nazi agitators. Rather the Doctor, Amy and Rory are travelling between two dimensions, each with a different deadly danger. One is real, the other is fake, and it is up to Amy to choose which is which. The Doctor, Amy and Rory land in the small Welsh village of Cwmtaff in 2020, as opposed to their slightly more exciting intended destination of Rio de Janeiro. Instead of Carnival and the world’s most exotic beaches they encounter a mining operation, led by Doctor Nasreen Chaudry, studying minerals deep in the earth that have not been seen for over 20 million years. Much partying ensues. In 2020, Dr Nasreen Chaudry is leading the deepest drilling of Earth's crust in history. But deep beneath, reptilian humanoids are drilling up, and the twain is bound to meet. The Doctor attempts to pass himself off as a human by indulging in a little share housing; but there's a mystery about his new abode, as people have been seen going up the staircase, but never down. The Doctor and Amy Pond, following a message from River Song engraved on the oldest planet in the universe, arrive in Roman Britain on Earth in 102 AD, where they find River posing as Cleopatra. River shows the Doctor a Vincent van Gogh painting titled The Pandorica Opens, depicting the TARDIS exploding. River had recovered the painting in the 52nd century, and travelled to the time-space coordinates on the painting using a Vortex Manipulator. The Doctor realises the "Pandorica", a fabled prison for the universe's deadliest being, must be stored in a memorable location near the coordinates, such as the site of Stonehenge. An assortment of the Doctor's deadliest enemies descend on Stonehenge, as the mystery of the Pandorica is revealed. 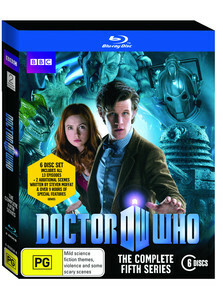 Series Five is now available on Blu-ray in its entirety courtesy of Aunty that comes with a host of special features, including in-vision commentaries, confidential featurettes, video diaries, teasers and a 6 page booklet. As mentioned elsewhere on these pages the episodes are some of the strongest of the franchise’s decades-long history, and Smith and Gillan more than hold their own against a slew of murderous reptiles, deranged historical personages, fellow time travellers, alien vampires and the perennial DALEKS. The faultless 16:9 widescreen transfer is really something to behold, and the accompanying 5.1 surround soundtrack is a suitably robust affair. Longtime fans and newcomers to the series alike alike will find plenty to enrapture, entertain and excite.